Hello, you lovely, inspirational reader of this blog! That book up there is my attempt at answering every question you have ever asked me about shea butter. I think it's quite fair to say you inspired this book. When I started working on it, I honestly expected it to be a rather small-ish, not-too-many-pages, handy-dandy little DIY guide, but it just kept growing. There were so many things to get to the bottom of, and more questions popped up, and then more things had to be examined and tested. So it ended up taking 2 years and grew to a full 72 pages of non-stop shea buttery-ness. 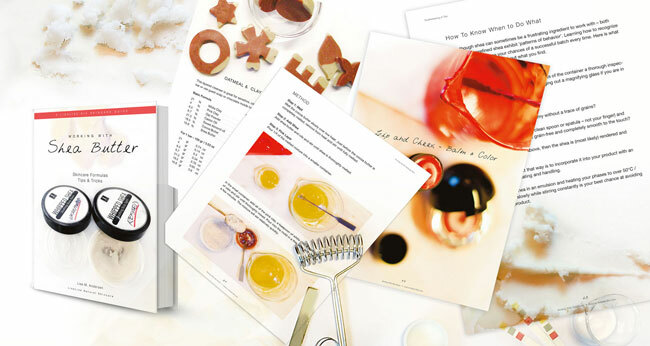 This book has formulas – from no-soap cleansers to lip balms, melt-and-pour products, whipped butters, emulsions, and even colored products such as lipstick. 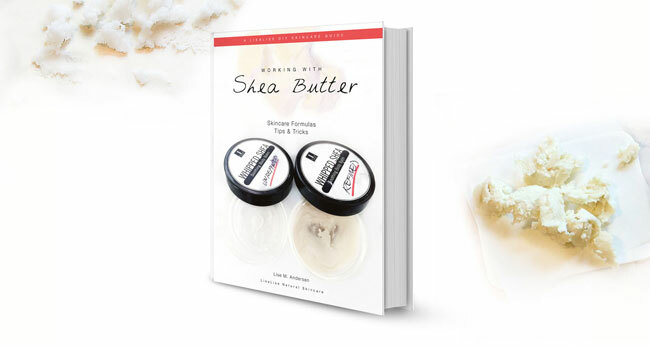 There are 14 of my most tried and tested formulas with shea butter – most of these include tips on how you can tailor the formula to make it your very own. If you follow this blog, you may even have seen some of the formulas right here. Well, now that's not entirely correct. You might have seen some of the pictures. You see, I went back and revisited, retested, and rechecked every formula an extra time before it was allowed into the book. I just couldn't bear the thought of disappointing you if you decided to buy it. So I had to be absolutely sure you were getting the most updated information – all the way through. I've also included shea butter tips and secrets that have never been on this blog – ever. So if you want to get busy with shea, please pop over to my webshop and take a closer look. There is a complete table of contents so you can check out every chapter and every formula the book contains. And if you'd like to give hand-crafted skincare products this year for the holidays, you might find a few easy-to-make skin-loving items that will make you look like a pro – even if you're an absolute newbie. Thank you for your always inspirational questions. What a wonderful book! love it!